Everything Changes – The Guide to Young Adult Cancer » Does Your Caregiver Get A Break? Does Your Caregiver Get A Break? I’m still living with cancer in me. But it’s been years since my last treatment. Now that treatment is farther in the past, my mom and I are able to talk about it more, especially about her caregiving role. She flew across country, lived in my tiny apartment, and took care of me for weeks at a time. The desperation of her statement was a shocker. My mom’s no shy country mouse. Drop her in a new city with a street map and she’s taking public transit to parts of town I’ve never heard of. But this was different. 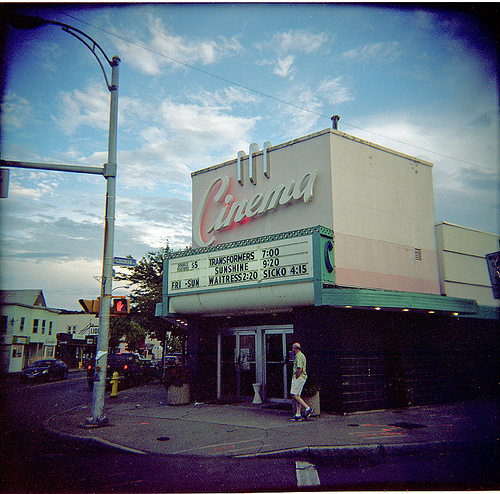 Few things are more painful to a mom than seeing her kid critically ill. She needed to flee our little infirmary and zone out in front of the big screen. I was too absorbed with my own illness to even realize. My mom is still a huge support to me. But my husband Shannon has now taken over as my main caregiver. It’s super stressful for us when we are waiting for test results or dealing with my treatment and care. I shoot out emails to his friends when it gets close to high anxiety dates (scans, big doc appointments). I ask them to take him out for beer. (Belgian at the Hopleaf if possible.) Is it my job as the patient to help take care of my caregiver? In small ways, when I am physically able, I think it is. If you’re a caregiver, what do you do to take care of yourself and get time away? Is it hard to make time? If you are a patient, do you think your caregiver spends enough time taking care of themselves? Are you able to help them get some time away? 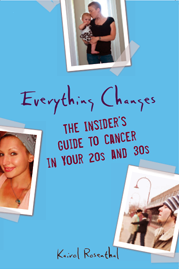 Read hard to find practical tips and resources for caregivers in Everything Changes: The Insider’s Guid to Cancer in Your 20s and 30s. Awesome post Kairol. I just talked about this in my blog not so long ago. I think its really easy, as a caregiver, to forget that sometimes you need to be taken care of too. Rick used to try to get me to take a break, but I think I was often SO afraid to leave him alone, not because I worried that he’d need me, but because I worried Id come home to find him, well, gone. 99% of the time, I’m left taking care of myself. But I think that it’s important to occasionally take a break and let somebody else do something. Taking care of somebody is a big deal. I’d definitely want any caretaker to take occasional breaks. Great post. I was a caregiver for my mom,sometimes it was hard to take a break, but sometimes the stress of her husband’s illness(Parkinson’s) and my mom still trying to caregive for him eventhough he had home health aides at his side most days, my mom couldn’t stop caregiving. I did take a 2 week break from the intensity of the caregiving, only to come back and my mother was worse and I knew that if I hadn’t taken that break I would have been no good to my mom when she needed me most. I think caregivers are a selfless lot and giving us breaks is a good thing and I think your husband Shannon probably appreciates the going out with the boys and having a beer. I also understand where your mother is coming from too. Although I met my mom’s church “friends” and her neighbors but caregiving is a lonely task. I’m sure you appreciated your mom’s strength and courage. I’m glad that she told you what was in her heart. I don’t think she meant to hurt you, just that maybe she was lonely. I try to vary the things I have caregivers do for me (cook, visit, doctor appointments–especially chemo disconnect days). As for my main caregiver, my excellent husband, I make sure he gets his boys’ golf trips in a couple of times a year. I encourage people to take him out, to call him, to just give him some time away from the medical/chemo/surgical merry-go-round. I’ve also gotten to understand the rhythms of what I need…so if schedules conflict, I have redundant care plans I can easily set in motion. I think since the diagnosis, I listen better. I treasure more. I take care of him differently…but better in some ways. Anita’s comment “caregivers are a selfless lot” really popped out at me. Just as I never chose to be a cancer patient, I think the people in my life never chose to be caregivers. They simply chose to rise to the occasion. For this I am extremely grateful. I think that good caregivers are a selfless lot (sounds like you are one Anita!) But selfish caregivers certainly are out there too. Some care givers cannot hack it, are too scared or too self centered to step up in the way that the patient wants or needs. I have met many people whose parents, friends, or partners bailed on caregiving duty or just couldn’t get it right. A subject worthy of a blog post perhaps. Thanks for your comment Anita. Important topic, Kairol. Thanks for posting this. “I want my caregiver to take good care of herself or himself” is one of the “20 Things People with Cancer Want You to Know” from my book. And it’s one of the hardest statements for caregivers to hear, or at least heed. I loved it when friends or family took my husband David out for lunch or a beer when I was in the hospital, but I know it was not easy for him to leave me, so can’t imagine how difficult it was for your mom – and how much she needed a seductive invitation to get her away. Again, thanks for this post. Excellent, as always. I am a caregiver for my disabled son..been at it for 16 years. I find that taking a break is great while on the break, but coming back is horrendous. I would rather almost just keep plugging along than have to deal with the feelings I get when returning. I am immediately disappointed, wishing I was still away, more resentful than when I left. I know that sounds terrible, but when I am away..ahhhhh..it’s SO nice. I know he didn’t choose this life, neither did I. Some days are better than the rest, but lately MOST days have been pretty bad…just my 2 cents..
Jen, I so appreciate the honesty of your comment. I’m curious if you get support from other moms of disabled kids and if they have any tricks for extending the ahhhh part of vacations. Or maybe it is just one of those life situations for which there is no remedy?